The PowerSeries Neo System can be armed using a keypad, a 2-way wireless key or a proximity tag. In an attempt to reduce false alarms, your system is designed to notify you of an improper exit when arming the system. When using the Push to Set, or Final Door Set feature, attempting to arm your system will start an infinite exit delay. The keypad will sound a beep once per second. When you have opened and closed the final door, or after pressing the Push to Set button, the exit delay will be reduced to a programmable value, which is typically 10 seconds, after which the alarm will complete the setting. The panel used this time period to allow time for the detectors on the system to return to their normal state. When this time expires, the system checks for detectors/windows/doors that may be open. If any of these are open, the panel will cancel the arming. If this occurs, you must re-enter the premises, check the system, close any open zones, and then attempt to arm again. Ensure all windows and doors are closed and that the Ready indicator is on. To Quick Arm the system press [*]. If zones have been bypassed, ICN or LED keypads bypass LED will light and the bypassed zones #s will be shown. On an LCD keypad a warning appears. Exit Delay timer begins counting down. Keypad beeps six times, continues beeping once per second until beeping rapidly in the final ten seconds. The system may be configured to have a persistent exit delay that only ends when the exit door is opened and closed, or when a button is pressed outside the protected premises. To cancel the arming sequence, enter your [access code] or present your proximity tag to the keypad reader. The installer configures the exit delay timer and whether or not an access code is required for arming the system. The control panel provides an option where, if a entry/exit zone is tripped a second time prior to the end of the exit delay, the exit delay time restarts. The exit delay timer can only be restarted once. The control panel provides a period of time in which the user can cancel the alarm transmission. If the programmed alarm transmission delay has expired, cancelling an alarm sends a message to the monitoring station. Upon a successful transmission of the cancellation message the keypad will beep 6 times. Note: Must be enabled and configured by installer. Note: For CP-01 systems, alarm transmission delay must not exceed 45 seconds. 2-way wireless keys allow users in the close proximity of their house the ability to readily arm/disarm their system, and to call for help. For information on enrolling wireless keys see “User Labels (LCD keypads only)”. Press the desired Arming mode button anytime the system Ready indicator is on. 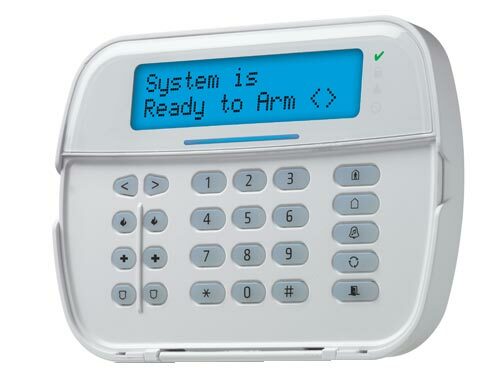 Depending on how your keypad is programmed, proximity tags can be used to either arm/disarm the system or to perform a programmed function (e.g. unlock a cabinet or storeroom door). Present your Proximity tag to a keypad equipped with a proximity sensor anytime the system Ready indicator is on. If configured by your installer, enter your access code. Enter your [access code] or present your proximity tag anytime the system is armed. If you walk through the entry door, the keypad will beep. Disarm within ___ seconds to avoid an alarm condition. Press the disarm button anytime the system is armed. If you walk through the entry door the keypad will beep. Press the disarm button within ___ seconds to avoid an alarm condition. Note: After disarming a system with an HS2LCD keypad using a 2-way wireless key, always check the alarm memory to determine if any alarms have occurred during the armed period. Present your proximity tag to a keypad equipped with a proximity sensor anytime the system is armed and if configured as required, enter your access code. if you walk through the entry door the keypad will beep. Present your proximity tag within ___ seconds to avoid an alarm condition. Note: Duration of Entry timer is programmed by installer. The installer will advise the maximum duration of entry delay that was programmed in the system. It cannot exceed 45 seconds. If your code is invalid, the system will not disarm and a 2-second error tone will sound. If this occurs, press [#] and re-enter your access code. Installer and Master code are system codes that can be changed but not deleted. The other codes are user-defined and can be added or deleted as necessary. By default, access codes have the same partition and attribute programming as the code used to program them. Additionally, there are no disallowed codes. Master Code By default the master code can access all partitions and can perform any keypad function. This code can be used to program all access codes, including the supervisor and duress codes. The master code is code # . This type of access code is used to arm and disarm assigned partitions and can access the User Functions menu. Supervisor Codes Use when you want to allow additional users to manage Access Codes [*5] or User Functions [*6]. Supervisor codes created by the master code will have the same attributes as the master code. Supervisor codes created by another supervisor code will have the same attributes, except the supervisor attribute. Must be assigned manually afterward. After creation, attributes can be changed for all supervisor codes. For information on how to program supervisor code see “Configuring additional User Options”. Duress Codes Use if forced to access your keypad under threat. Duress codes function the same as user access codes, except they transmit a Duress Report to your monitoring station when used to perform any function on the system. Duress codes cannot be used to access Access Codes [*5], User Functions [*6] or Installer [*8] menus. For information on how to program a Duress Code see ‘Configuring additional User Options”. One Time User Code Used to grant someone one-time access to your home once per day, i.e. a cleaning person or contractor. The ability to disarm the system is reset at midnight or when the one-time user code is keyed in by the master code user. For information on how to program a One Time User Code see “Configuring Additional User Options”. press [*] and use the scroll keys to navigate to Access Codes and press [*]. Enter [Master or supervisor code]. scroll through the list of users and press [*]. On an LED keypad the user number will begin flashing. To go back to the Ready state press [#]. Access codes cannot be duplicated. From the desired user press [*] or . Enter a new 4, 6 or 8-digit access code. After entering a new code you will be automatically returned to the previous menu, and on an LCD display the flag is changed to P from -. On an ICN or LED keypad the programmed user will have their digits displayed. If a duplicate code is entered the error tone will sound. After the code is programmed, the keypad returns to the previous LCD display. Press [*]. The code is deleted, and you are returned to the previous screen. The flag is changed to – from P. On an ICN or LED keypad the programmed user’s digits will cease being displayed. After the code is programmed, the keypad returns to the previous LCD display. Note: Any proximity tags associated with deleted user codes will need to be re-enrolled. Pressing both the emergency keys generates a Fire, Medical, or Panic Alarm and alerts the monitoring station. e.g. to generate a medical alarm press both of the medical alarm keys for 2 seconds and the display on an LCD keypad will show Hold down keys for Med. Alarm. The keypad beeps to indicate that the alarm input has been accepted and sent to the monitoring station. Note: Verify with your alarm company that your system is equipped with emergency keys. Note: Fire keys can be disabled by the installer. Note: Having an optional audio verification module installed in your system allows the monitoring station to open 2-way communication when notified of an alarm. 2. Press  or use the scroll keys to navigate to System Test and press [*]. The system activates all keypad sounders, bells/sirens and keypad LEDs for two seconds. 3. To go back to the Ready state press [#]. Occasionally, you may have a problem with your Alarm Controller or telephone line. If this happens, your Alarm Controller identifies the problem and displays an error message. Refer to the provided list when you see an error message on the display. If additional help is required, contact your distributor for service. Note: This equipment contains no user-serviceable parts, except for the keypad batteries. Dispose of used batteries as per local rules and regulations. The Trouble indicator turns on. The keypad beeps once every 10 seconds. Press the [*] key to silence the keypad beeps. Press [*] to examine troubles. When viewing troubles, the trouble indicator flashes to identify the level of trouble being viewed. One flash = level 1, two flashes = level 2 etc. Arming of your system may be impeded by a trouble. To override this condition, enter [*], scroll to Acknowledge All Troubles and press [*] or enter 999. Note: Trouble #’s are used to identify the number to view the trouble and depending on the keypad type being used, identifies which LED or digit illuminates to display the trouble. Similarly, Trouble Notification identifies the range that may be displayed on the keypad. When exploring the trouble levels, the Trouble indicator will flash to identify which level you are currently viewing. Each 3 Digit Zone number is one entry. Repeat the process if isolating more than one zone. E.g [*]+ THEN  will bypass zone 5. Any additional entries will bypass other zones.